Start by draining your old oil. Then clean the drain plug on the oil pan, and wash off before you reinstall your oil plan. To check your oil run your car for at least 15 minutes so that the oil warms up. Turn the engine off, wait 15 minutes so the oil can drain back to the oil pan. Reinsert it and push it all the way in. Again pull the dipstick out and read the oil level. It should be somewhere between the hash marks. If in the add region add oil according to your manufacturer’s specifications. Today’s manufacturers recommend a longer period between oil changes, the fact remains the more often abrasive dirt and metal particles are removed from your engine the longer it will purr like a kitten. It extends your engines life. If you want to maximize your engine refer to the schedule for severe intervals in your owner’s manual. This is especially important if you drive in stop and go traffic regularly. For years it was recommended your oil be changed every 3000 miles. Those intervals are increasing but there’s no harm in sticking to the old numbers. There are a number of oils on the market. Let’s quickly review them. Detergent Oil – Almost all modern multi weight oils are detergent oils, which remove soot from the internal engine parts, and then suspend those particles in the oil. These particles are too tiny to become trapped by the oil filter so they stay floating in the oil. This is what makes your oil turn darker. These particles don’t hurt your engine. However, when the oil becomes saturated it cannot continue to hold these microscopic particle. Current oil change schedules occur before this happens. Oil Viscosity – The viscosity of the oil is specified using two numbers. The first number is the viscosity when the oil is cold. You will then see the letter W followed by another number. The W stands for “winter.” Most people think it stands for weight. There will then be another number, which tells you the viscosity when the oil is at operating temperature. The oil gets thicker as the number gets bigger. Climate Considerations – Your owner’s manual will list which oils are acceptable to use at different temperatures. For example, if you live in a warm climate 10W30 is an acceptable alternative to 5W30. In the past there was a summer oil and a winter oil. That’s no longer the case. However, if you live in a warm climate and you are using 10W30 then make sure you switch to 5W30 for the cold season. When you change your oil you will also change your oil filer. The easiest is to follow what the manufacture recommends for filter, but there after also after market filers provided by companies like Valvoline, Pennzoil, Casite, Motorcraft, and many more. These filters will match to the manufacturer’s filters. Keep in mind the quality of manufacturers filters is much higher than the aftermarket filters. There are also what are referred to as trade brand filters, which are found at many of the quick oil change places. For those who use synthetic oil premium filters are often used. They are higher priced but the benefits have been proven. In recent years manufacturers have been telling us that we don’t need to change our fuel filters so often. We still recommend changing your fuel filter at least once a year. When a fuel filter gets clogged it will cause your engine to perform poorly, and it will reduce your gas mileage. It’s also a warning sign for a gas tank that’s beginning to corrode. You will see those particles in the filter. Check your air filter every couple of months and when it’s dirty replace it. Air filters are easy to change. With carbureted vehicle you just remove the big metal lid – you can’t miss it. With fuel injected cars you remove the rectangular box. Your manual will show you exactly where to find it. 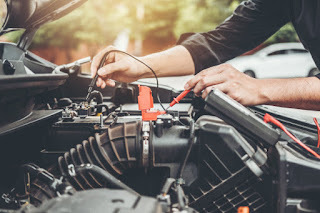 It’s important to change your transmission fluid after the first 5,000 miles or 8,000 km in a new car and then after that every two years or 25,000 miles or 40,000 km. Don’t overfill your crankcase with oil, because if you do air bubbles will form in the oil and then the oil pump will not be able to function properly. This can lead to engine overheating and stress on a variety of engine components. It can also cause fouled sparkplugs. The PCV valve or positive crankcase ventilation valve is part of the emissions system in older cars. The valve’s job is to re-circulate partially burned gases from the engine crankcase to the combustion chamber. It’s very important and should be changed every 30,000 miles or 48,000 km. It also help to improve gas mileage by preventing the buildup of harmful corrosion and sludge. If you use your vehicle to tow a trailer of some kind you should have an oil cooler installed. You could also install a transmission cooler. They are easy to install, cost very little, and save you huge bucks in major engine and transmission repairs. better and you’ll enjoy improved gas mileage. Hoses become brittle and can break with time. When the car is shut off and has cooled, squeeze the hoses. If they are extremely stiff, make a crunch sound, are soft or sticky, have bulges, or looked collapsed in any section, it means the hose is weak and should be replaced. You should never drive with a damaged coolant hose and your engine could overheat and you could land up with a very expensive repair bill. You should check the tension of all your belts. You should also check for wear. You’ll find belts that run your AC compressor, power steering pump, and water pump. To check for tension press in the center of the belt where the longest exposed part is found. If you can depress the belt ½” to 1” or 13mm to 25mm, but no more, the tension is good. If not you can either take your car to auto shop for adjustment or if you are handy do it yourself. Watch for cracks and fraying, which mean you should replace the belt(s). Your manual will tell you when you should replace the timing belt at 50,000 miles but it does vary. When a timing belt fails it can result in thousands of dollars in engine damage so it’s best to be proactive. It’s a good idea to do an engine clean every couple of years. By removing all the grime and dirt it becomes much easier to see any leaks you may develop. When washing your vehicle remember to take care to not soak important engine components such as distributor caps, or electrical parts. You can cover them with plastic bags. Liquid dish soap works well to cut grease. There are also many excellent grease cutting detergents on the market.